Whether you have a family to protect or just want to improve your chances of avoiding an accident, it helps to know the safest cars to drive. This list can be especially helpful when you're buying a new car. Safety is about more than just how a car performs in a crash. There's also accident avoidance, design attributes that make a car less likely to roll over or skid out, and safety features that protect a car's occupants. Anti-lock brakes help you avoid skidding when you step hard on the brake pedal. Instead of pumping the brakes the way you had to do in older cars, the anti-lock brake system does this for you. This feature lets you keep control of the car during hard braking. Traction control allows your car to sense whether a wheel is slipping on icy or wet roads. Your car then compensates for this slipping, allowing you to retain control. Air bags are one of the most important developments in vehicle safety. Most new vehicles feature front airbags, but the safest cars also have side curtain airbags. Seat belts are one of the most important safety features in a vehicle. Although they have been around for decades, new advances in technology allow them to be more effective in protecting the occupants of your car. LATCH systems allow optimal fastening of a car seat or booster seat. This is important, because a huge percentage of safety seats are installed incorrectly. Certain car colors are easier to see than others. Silver, for instance, may blend in with the color of the pavement. Yellow is one of the easiest colors to see. Some cars have a high center of gravity, which makes them more prone to rolling over. If you're considering an SUV or other tall car, look at the government crash test ratings for a specific model. Blind spots can make it hard for you to see other vehicles while you're driving. Test drive a car before buying, and check for blind spots. Which Are the Safest Cars to Drive? If you're considering buying a new car for its safety rating, make sure you get the most recent information about the vehicle. Consider subscribing to a site like Consumer Reports, which tests vehicles based on several handling and crash test parameters. 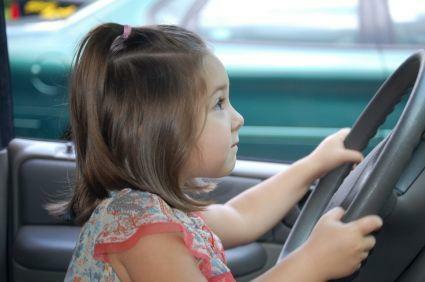 Don't allow kids to distract you when driving. Try to minimize use of the radio or other controls. Leave your headlights on during the day to help other vehicles see you. If you find you're getting tired, pull over. Avoid going through yellow lights. Slow down when driving in slippery conditions.